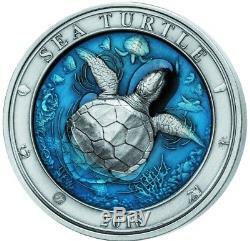 Description This beautiful 3 Oz Silver coin is the Second issue in the new Underwater World series and is dedicated to the worlds number one apex predator the Sea Turtle. The coin has a beautiful marine-blue Enamel that creates a stunning 3D-effect, has an Antique Finish quality and comes in a case, along with the Certificate of Authenticity. Limited mintage to 999 pieces worldwide. Country:Barbados Year:2018 Face value:5 Dollars Metal:Silver 999 Weight : 3 Oz Diameter (mm):50 Quality:Antique Finish Mintage (pcs):999 Certificate COA:Yes Box:Yes. 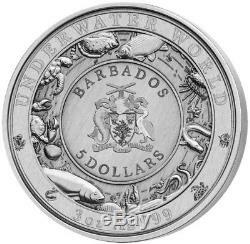 The item "BARBADOS 2018 3 Oz Silver $5 SEA TURTLE UNDERWATER WORLD Coin" is in sale since Tuesday, February 06, 2018. This item is in the category "Coins & Paper Money\Coins\ World\Australia & Oceania\Other Oceania Coins". The seller is "coinmaster83" and is located in Pleasantville, New Jersey. This item can be shipped worldwide.